Too often men focus mainly on a woman’s appearance when they are considering whom they will date or marry. But there are more important traits to consider. There is a folk tale of an elderly king somewhere in the heart of Africa. He had only one son, whom he adored. When the time came for the young man to find a wife, the king reminded his son she needed to be a woman qualified and capable of one day serving as his queen. So the young man began his search for such a woman of beauty and character. He believed most young women would put their best foot forward if they knew he was the prince, so he chose to disguise himself as a peasant farmer. The beautiful ladies he saw around the palace regarded him with disdain, so he went on. Farther out he came across some young ladies who would stop to speak with him, but they were silly or rude, clearly not fit to be queen. After several weeks, he came to a tiny village in the farthest reaches of his father’s kingdom. A beautiful maiden saw him looking tired and hungry, and she offered him food, water and a place to rest. He discovered she was kind, intelligent and wise. He knew she was the kind of girl who could become a wise and helpful queen, and he wanted her as his wife. Her father voiced concern that his daughter would marry such a poor man, but the girl reasoned with wisdom and conviction, and her father relented. The prince in disguise returned home to prepare for the wedding. Soon the young man returned, but this time as himself, the prince. They married, and years later he became king. His princess proved to be the wise and understanding queen he knew she would be, and together they ruled the kingdom with wisdom and justice. The story emphasizes something too many men underestimate when looking for a mate: the importance of a woman’s character. It isn’t all about physical beauty or even personality. In describing the nearly perfect woman in Proverbs 31, Solomon wrote, “Charm is deceitful and beauty is passing, but a woman who fears the LORD, she shall be praised” (verse 30). 1. Is she a woman of God? What foundational element of character could be more important? In describing how the wife of a congregational leader should be, the apostle Paul wrote, “Wives must also be of good character. They must not be gossips, but they must control their tempers and be trustworthy in every way” (1 Timothy 3:11, God’s Word Translation). Such a woman will show by her words and actions that she submits to the rule of her Creator. Her relationship with God will come first in her life, and her faithfulness will shine through everything she says and does. As Ruth famously said, “Entreat me not to leave you, or to turn back from following after you; for wherever you go, I will go; and wherever you lodge, I will lodge; your people shall be my people, and your God, my God” (Ruth 1:16). This basic attitude should be the No. 1 characteristic a man looks for in a wife: a woman who is committed to being faithful to God her entire life. 2. Who has the greatest influence on her? We all have people who have a powerful influence on us, so considering whom she chooses to be influenced by is important. When we were children, our parents were probably the biggest influence in our lives. But as we move through adulthood, others exert a heavier influence on us. To whom does she look to the most for advice? Are these people of solid moral character? Solomon also wrote, “The righteous should choose his friends carefully, for the way of the wicked leads them astray” (Proverbs 12:26). Take a careful look at her closest friends and advisers and see what direction they influence her toward. Is she first and foremost attentive toward God and His laws? Is she also tenderhearted toward others, wanting to help and serve others when she sees a need? Is she first and foremost attentive toward God and His laws? Is she also tenderhearted toward others, wanting to help and serve others when she sees a need? Think of the father of the prodigal son, who saw his son coming from a long way off and “had compassion, and ran and fell on his neck [hugged him] and kissed him” (Luke 15:20). 4. Is she willing to learn and grow? This is a reflection of her heart. Perhaps nothing reveals a person’s depth and genuine level of humility more quickly than having a heart that is teachable. Not everyone can see a need to learn more and accept instruction. Business leaders recognize that some people have 20 years of experience, and others have one year of experience, 20 times over. A teachable person will be learning from his or her own mistakes, as well as those of others, and will be constantly growing and maturing. “Give instruction to a wise man, and he will be still wiser; teach a just man, and he will increase in learning” (Proverbs 9:9). 5. Is she wise with her words? Talk is cheap. Many people throw around words freely, saying whatever they believe you want to hear, but never really meaning it. Others liberally sprinkle their conversations with gossip and scintillating tales about others. It used to be far less common for a woman to use vulgar or profane language, but that societal taboo seems long gone now. Women today are often as crass and crude as men can be in their speech. But a woman of godly character will not allow her speech to become infected with anything that is improper or sinful. There are many more qualities of character we can and should consider, but these are a starting point. They are also more challenging and more difficult to attain than they might seem at first glance! You won’t find a woman who demonstrates all these traits perfectly, but look for the woman who is serious about trying to. 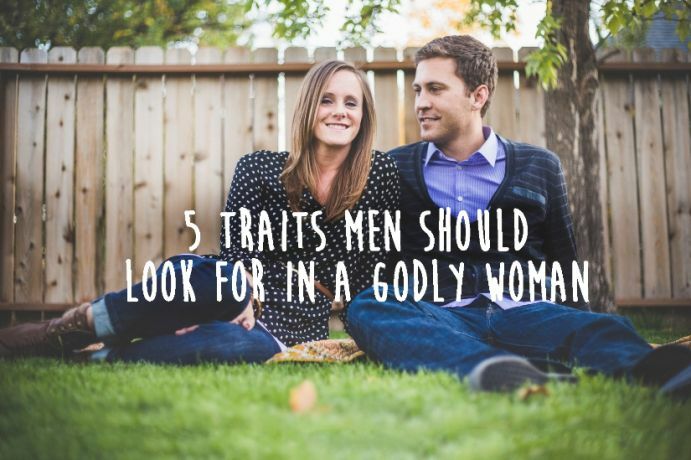 Of course, a godly man should never ask his wife to do and be what he isn’t himself. So he must be sure to be developing godly character himself. For further insight into male/female relationships, peruse our articles in the “Relationships” section of Life, Hope & Truth.